The Grand Banks 36 “Classic” was the first model in the Grand Banks fleet, 1200 were built of the finest Philippine mahogany. Halcyon is hull 285. She features twin staterooms which are all finished with warm handcrafted teak woodwork, varnish and paint' all recently redone and in very good condition. Topsides you will find raised bulwarks providing protection to the walk around decks. Her features include mahogany decks, a functional mast and boom, direct cockpit access from the aft stateroom, tender, and a spacious flybridge. She is powered by twin Lehman diesel engines. There is no other boat that has attracted such a loyal following of knowledgeable and conscientious boaters than the Classic Grand Banks Fly Bridge Trawlers. The distinctive good looks, remarkable workmanship, and ageless design make this boat stand out from all the other trawler yachts. Her good looks and comfortable accommodations make this yacht stand out amongst a harbor full of today's plastic wonders. She turns heads in every harbor, but is more impressive at sea where she provides an economical and comfortable ride in all reasonable conditions. The boat is a semi-displacement hull with a long keel, hard chines and a deep forefoot giving the Grand Banks “Classic” the reputation they are known for, their seaworthiness. Seaworthiness rarely matched by any other vessel in her class. Halcyon is wood, Philippine Mahogany on oak and yacal frames and bronze fastened. No fiberglass hull slap at anchor during the night, just the kindly soft groans and the security of a solid planked hull that make wood boats so dear. Built by the true artisans of American Marine in the Far East in 1972, this boat has all of the classic details that are missed by the modern trawler yachts today. The beautiful bright work and fine mahogany side rails and trim accent her ruggedly beautiful profile. The aft cabin and spacious cockpit give easy access to the comfortable flying bridge for those of us who dread those daunting ladders to the bridge. Wide decks and proper height rails make for easy and safe egress to the foredeck. Mahogany planked decks are the height of old world nautical beauty. Even launching the 9 ft Dyer dingy from the Sitka spruce mast and boom is the essence of old time yachtsmanship. The mast holds a steadying sail for an even better ride and a small boost in speed. Below, the three level cabins make for a surprising light and airy main saloon with big windows and a starboard side door for cross ventilation. Window treatments were installed in spring 2016. The lower helm station is fully functional and comfortable for poor weather sailing. The galley to port boats an enormous refrigerator, new in 2016, and a full size 3 burner propane range, also new this spring. A microwave oven and custom pan storage is below the stove. Built in cupboards and drawers give plenty of storage while the starboard L seating around the adjustable table opposite the port side bench seat give seating for six or more. Cushions were recovered in 2016. The original teak cabinetry and parquet floors' recently refinished, highlight the traditional comfort of this big trawler living area. Forward and down 5 steps is the forward cabin with traditional V berths and attached head with sink. Again teak built in shelves, drawers, cupboards and lockers highlight the charm of trawler living and great design. An overhead hatch gives good ventilation at anchor or underway. Deck prisms have been added to the hatch for light. Aft, and down three steps, is the master stateroom, again with teak built in cupboards, lockers and drawers. To starboard is a double berth while to port is a single berth. The large adjoining head is comfortable and sports a head, sink, and hot and cold shower. This is a very roomy cabin on a vessel renowned for being comfortable. Beneath 3 convenient hatches in the main salon are two Ford Lehman diesels and a typical marine engine room with full access to tanks, batteries, pumps and plenty of storage for spares. Halcyon carries 430 gallons of fuel and 170 water. She has just concluded a 7 week cruise covering over 1200 trouble free miles. At 8 mph, she burns only 2.5 gallons per hour. Halcyon has only 4200 hours on engines that can easily go 10,000 or more hours before needing any serious work. Halcyon is turnkey and ready to go...anywhere. Electronics and navigation equipment include: Northstar GPS/plotter, Raytheon radar and automatic pilot, 2 Navman 7100 VHF's, Standard Horizon depth meter, compasses and full engine gauges at both stations. Most systems have been checked and/or updated in the last year. 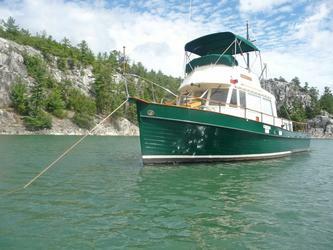 She has lived on the Great Lakes which makes for an easy life compared to salt water boats. She will be in the water until late fall.